In a year already loaded with big name sequels (i.e. 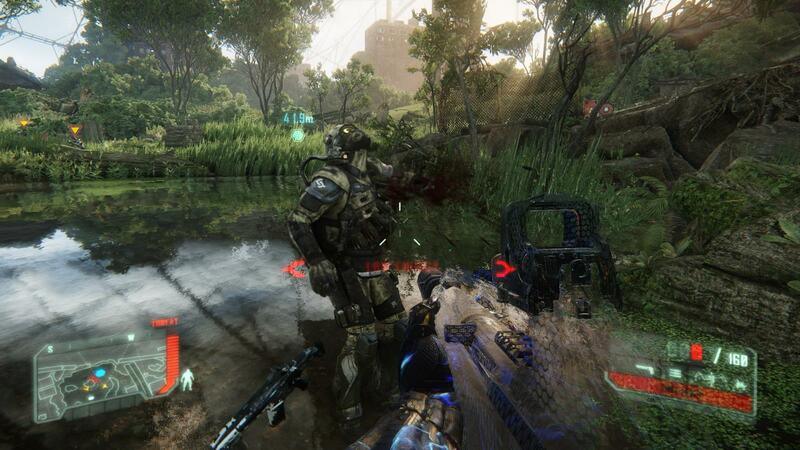 Bioshock Infinite, Dead Space 3), somehow Crytek’s Crysis 3 got lost in the shuffle. Surely, a big budget first person shooter with gorgeous visuals would manage to snag a large slice of the pie, right? Unfortunately, no, that is not the case here. Instead, Crysis 3 offers more of the same with little to differentiate itself from its superior predecessors. The story, never a strong suit in this series, is basically a rehash of before. Aliens are still invading the earth, and the evil CELL organization is up to no good. It’s up to the Prophet character and his powerful Nanosuit to save the day once again. 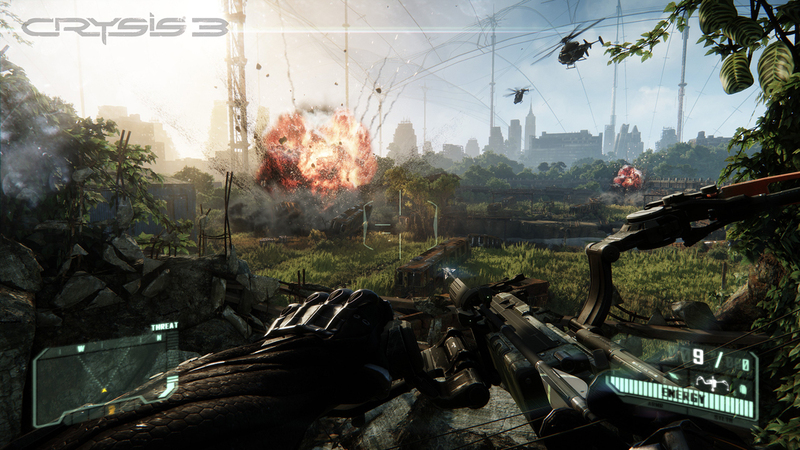 Even the game’s setting is familiar; whereas Crysis took place in the jungle and Crysis 2 in New York City, Crysis 3 is set in a jungle in New York City. Yeah. The plot is absolutely ridiculous and is just there to pad out an already thin single player campaign, which itself can be completed in a mere 4-5 hours. 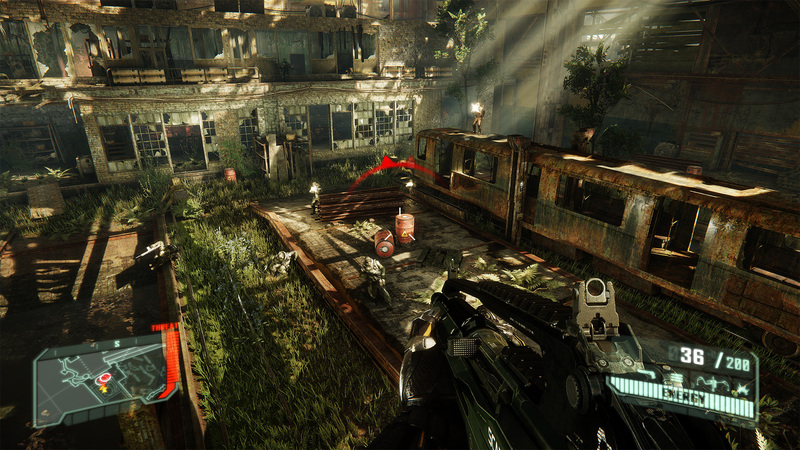 The campaign feels even more linear than Crysis 2, as much of the game’s progression requires following along Prophet’s old comrade, Psycho, from checkpoint to checkpoint. Occasionally there are wide open areas that allow some semblance of freedom, and that is when the game is most fun. Using the Nanosuit remains a real treat, as the abilities to use both heavy armor and cloaking features are what sets Crysis apart from other FPS titles. Being able to go invisible for short bursts at a time allows the game to be played stealth-like; this is especially convenient when there are nasty enemies lurking about. The heavy armor feature is helpful, too, for those who just like to go in with a heavy rain of fire. 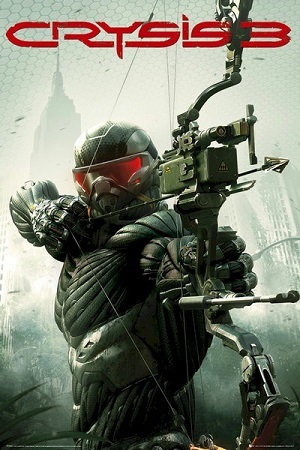 The biggest addition to Crysis 3 is a bow. At first, this feels like an underwhelming inclusion, and Prophet even remarks as such when he first receives it. However, this is not an ordinary bow; it’s basically an all-in-one killing machine. This new weapon is incredibly overpowered, as it allows Prophet to stay invisible while firing, and it can wipe out enemies from a significant distance. Using the bow almost makes the game *too* easy, and I found myself not even using it unless truly desparate. The actual combat and shooting are solid, and the controls are tight. There are plenty of weapons to choose from, and the enemies are diverse enough to keep things interesting. It’s just a shame that the campaign is a mostly unmemorable affair that never fully utilizes the groundwork laid by the core gameplay mechanics. There are no noteworthy set-pieces as found in the first two games, and it truly feels that Crytek were just going through the motions with this effort. The multiplayer is extensive and has the ability to be a huge plus; unfortunately, it is nearly dead just three months after its release. I have put in a few hours online, but never saw more than a few hundred people playing at a time. Nearly all of them were playing Team Deathmatch, and several of the other playlists had no gamers at all. That is absolutely sad for such a new release, especially since the stealth/armor mechanics are a refreshing change of pace from the Call of Duty series. When you do manage to get into a full game, the experience is enjoyable. The maps are pulled straight from the campaign, and they are big enough to take advantage of all aspects of the Nanosuit. Perhaps the recent price drop will bring in a bigger online community, but I’m not holding my breath. In a nutshell, Crysis 3 is a visually stunning game — one of the prettiest on the Xbox 360 — but it is a hollow one. This had the potential to be truly special, but the rushed campaign is a huge disappointment and a major step down from the first two games. There is still a competent shooter underneath, but there’s no question that this will be known as the black sheep of the Crysis series. Problem with these shooters is that I have to talk the crew of guys I play with to buy or rent it. That would require them not playing COD and that is sadly a hard sell. Haha, I know what you mean. I had one friend who also bought the game but he ended up selling it pretty quick. Shame that the community didn’t take off for this one. I feel like every successive game in the Crysis franchise shows a dip in quality. Not only was the first in the series a truly remarkable achievement in terms of graphics (I remember it being used to measure whether your personal computer was worth crap back in the day), but the story packed a little more punch, feeling fresh and surprising. In fact, the jungle setting made it a bit more suspenseful and exploring the alien airship was a treat. Having just finished Crysis 2 (I’m a cheap gamer, and I wait and wait until titles are worth nothing), I can see why you would think the latest entry just feels like the same old box of tricks wrapped up with even better graphics. I find very interesting how games, especially shooters have changed over the last few years. Now they’re criticized if they don’t allow players freedom, when back in the day freedom was nowhere to be found and it was a matter of shooting your way to a boss fight. Nowadays, freedom and choice are almost a requirement, forcing developers to make larger environments and giving players a wealth of choices that enhance the replayability value of a title.This, of course, is a much welcomed progression that can only lead to more complex and beautiful games in the future. That’s about all it has going for it, unfortunately.